Notes: Available in varying sizes, the Pacato plug is comfortable, completely discreet and offers the most natural sound of any generic fit earplug in its class. With Pacato you can hear what you need to hear with all the clarity that you're used to and easily converse and communicate without putting your hearing at risk. The Pacato is one of the most discreet universal-fit plugs available with a flush fitting filter that enables the plug to sit comfortably in the ear with no protrusion making them ideal for use under headwear or in any situation where discretion for the wearer is desired. Offering an average of 16dB protection the Pacato is suitable for use in most amplified music or other loud noise environments keeping your hearing safe from damaging exposure to excessive noise but ensuring that you stay involved in the performance. Using Pacato earplugs you can enjoy your music at a level that suits you without losing the fidelity of the sound as you might with foam earplugs, in addition, the Pacato keeps all the atmosphere allowing you to hear what's going on around you and communicate clearly with others so you don't have to feel isolated from the music, the atmosphere or the people to keep your hearing safe from harm. Trying to create a natural sounding earplug is no mean feat as far as your own voice is concerned because, as you will have experienced, when you block off your ear canal your own voice starts to boom inside your head, this is what we call occlusion. Occlusion is caused by sound that is carried to your ear canal through the cartilage at the side of your head and usually escapes through the open ear canal so is not heard. When we block off the canal this sound cannot escape and so creates that booming effect. A large amount of occlusion can be eliminated by ensuring that the earplug sits deep enough into the ear canal to extend past the cartilage so that the sound hits the plug and is deadened rather than entering the canal at all but the Pacato filters go one step further. The Pacato is vented to allow sound to pass both ways which means that remaining sound can escape directly through the filter providing one of the most natural sounding earplugs available. The Pacato also offers resilience to moisture and wax build up. Being shielded from external moisture with the hard outer shell means that the fabric filter membrane is protected from the elements so your earplug will keep on performing in adverse conditions but, in addition, the filters and plugs can be cleaned to keep them performing for years to come. The Pacato plugs from ACS offer a perfect cost-effective solution to protect your hearing in a variety of environments whilst making sure that you get one of the most natural sounding earplugs available. Notes: Pacato from ACS represents a leap forward in ready-to-go hearing protection for anyone that's exposed to excessive noise. Featuring the same design features that have made the ACS PRO series so successful the Pacato now brings a near flat response and the most natural sounding filter to a universal eartip that you can use right away. Available in varying sizes, the Pacato plug is comfortable, completely discreet and offers the most natural sound of any generic fit earplug in its class. With Pacato you can hear what you need to hear with all the clarity that you're used to and easily converse and communicate without putting your hearing at risk. Offering an average of 19dB protection the Pacato is suitable for use in most amplified music or other loud noise environments keeping your hearing safe from damaging exposure to excessive noise but ensuring that you stay involved in the performance. Using Pacato earplugs you can enjoy your music at a level that suits you without losing the fidelity of the sound as you might with foam earplugs, in addition, the Pacato keeps all the atmosphere allowing you to hear what's going on around you and communicate clearly with others so you don't have to feel isolated from the music, the atmosphere or the people to keep your hearing safe from harm. The Pacato also offers resilience to moisture and wax build up. Being sheilded from external moisture with the hard outer shell means that the fabric filter membrane is protected from the elements so your earplug will keep on performing in adverse conditions but, in addition, the filters and plugs can be cleaned to keep them performing for years to come. The Pataco plugs from ACS offer a perfect cost-effective solution to protect your hearing in a variety of environments whilst making sure that you get one of the most natural sounding earplugs available. 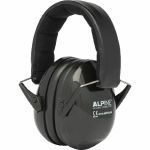 Notes: The lightweight Alpine MusicSafe Earmuff is especially for musicians that are regularly exposed to loud music. For example, it muffles 25 dB of the sound created when playing drums. With this level of attenuation, your ears are well protected and you can comfortably play your favourite instrument! The earmuffs are ideal for practising, rehearsals, performances or music lessons. The headband is made of a soft fabric so you can wear it with optimal comfort. The soft ear surrounding cushions apply extra comfort to make sure your ears are comfortably protected. The sturdy and cool ear protectors are foldable and, therefore, easy to take with you to a music lesson, rehearsal space, studio or gig. The earmuffs fit young and old drummers because of the adjustable band. Notes: As a musician, such as a guitarist, drummer, singer or DJ, you face significant risk of hearing damage as you're often in an environment with loud music. Hearing loss has a direct impact on the performance of your profession or passion because your hearing is the most essential gear. Good hearing is essential and properly protecting your hearing is important during rehearsals, performances and concerts. Our luxury model MusicSafe Pro has been specifically developed for musicians. This is the most luxurious and extensive edition of the Alpine music range, with three sets of exchangeable filters, allowing you to determine your own protection. Notes: DJs run a considerable risk of damaged hearing. Loud music can lead to hearing loss and other physical problems. 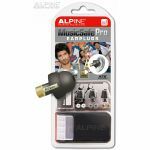 The Alpine Music Safe Pro Hearing Protection System is earplugs that contain three different filter sets, providing low, medium, and high attenuation rate to suit every situation. The calibrated filters are designed for listening to music whilst providing optimum hearing protection without loss of clarity. Music Safe earplugs are very comfortable, and do not cause pressure on or in the ear. Instructions for use are included. Notes: Musicians and DJs are at great risk of incurring hearing loss as a result of the fact that they are often in areas with loud music. For a musician, his/her hearing is the most essential gear. Hearing loss has a direct impact on how they are able to perform their job or passion. Therefore, excellent hearing protection is essential during repetitions, performances and concerts. Alpine luxury model MusicSafe Pro has been specifically developed for performers. MusicSafe Pro contains three different and exchangeable sets of music filters with outstanding sound characteristics with low, medium and high attenuation rates. 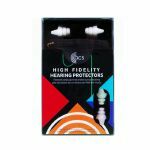 These special music filters guarantee an optimal protection without loss of clarity, while at the same time you can perfectly enjoy the music. 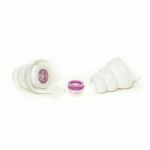 MusicSafe Pro earplugs are produced from a very soft, flexible and durable thermoplastic material. Due to the warmth of the ear it adapts to the shape of the auditory duct. Therefore, MusicSafe Pro is very comfortable to wear. 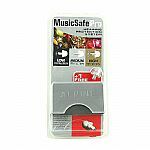 MusicSafe Pro earplugs with special music filters are an open system, so that one has no feeling of isolation. Twenty years of experience have allowed Alpine to develop a revolutionary new earplug model with a noise filter, that filters out damaging sounds. The extremely well thought-out and extensively tested shape of the earplugs, provides a perfect fit. In addition to a practical storage container, every PartyPlug pack also contains an easy to use Alpine Miniboxx. You can take this ideal mini storage container with you when you go out and you can open it with one hand (while holding a pint in the other...). The Miniboxx easily fits into your trouser pocket, handbag, bra, or sock. Notes: Pair of ear plugs for inserting into the ear canal to protect against noise. Multicoloured. Notes: Specially designed for travellers Flitemate earplugs from Heartech will add to your comfort whilst flying. They reduce noise and slowly balance cabin pressure changes that can cause pain and discomfort. Flitemates are also good for people that suffer pressure changes such as climbing a hill in a car, skiing and when high-speed trains pass in tunnels. Just insert the FliteMate Earplugs securely in both ears before takeoff and do not remove them until the plane has reached cruising altitude, then be sure to reinsert the plugs before the plane begins its descent to land. Since the FliteMate plugs also greatly reduce the background noise on the plane, your trip will be more comfortable if you just leave the plugs in your ears throughout the trip. Notes: NoizeBlox earplugs, with their funky and cool design, are manufactured from soft and light-weight hypo-allergenic PVC free foam. The excellent sound absorbing foam used in Noizeblox gives them a very high SNR rating of 35dB, they are ideally suited for use in extremely noisy environments. Their unique tapered design will insert easily into most ear canals, even those that are small. The foam will gently seal your ear and fit snugly without exerting any pressure that could lead to discomfort. In fact, they are so comfortable you could even forget you're wearing them. Notes: The ProGuard Lin-Ear PR20 Music earplug features a re-useable 19dB linear attenuation filter that is CE approved to EN352-2:2002. The filter fits neatly into soft flexible silicon eartips (2 sizes available, standard and small) that provide comfort and durability even after long periods of use. Fitting deep into the ear canal the earplug is discreet and has no protrusion allowing the user to wear headphones or other types of headwear if required. Specifically designed for musicians, DJ's, sound engineers, concert-goers and music enthusiasts, the Lin-Ear PR20 will enable the user to listen to loud music in perfect clarity, yet maintain the live atmosphere without risking hearing damage. The PR20's advanced membrane technology acoustic filter will provide natural undistorted sound with minimal occlusion effect, that's often associated with earplugs. The vented design of the Lin-Ear allows the trapped sound to escape through the acoustic filter as if your ear was open, leaving you with the most natural sound available. Notes: The ProGuard Quietear Earplug is truly innovative earplug designed and patented offer variable noise reduction (VNR) technology, letting you hear what you need to hear (voices and other sounds in the voice frequency range) while protecting you from dangerous higher frequencies, and providing increased attenuation as the noise volume at the ear increases. QuietEar earplugs have a built-in acoustic filter in the form of a precisely designed vent. As the volume of noise increases at the ear, QuietEar automatically provides increased attenuation, resulting in higher noise protection at higher noise levels. This means at lower noise levels, you can easily hear voices without having to remove your earplugs. In addition, QuietEar offers differential noise attenuation at high and low frequencies, which means sounds in the range of the human voice are always attenuated less than the higher, more dangerous, frequencies. The vent also means QuietEar is more comfortable for extended wear, allowing your ears to breathe and reducing the "plugged-up" (occlusion effect) feeling common with many solid earplugs. Made of durable and washable pre-moulded silicone, QuietEar plugs last for months or even years as long as they are cleaned with mild soap and water after each use. Notes: The ProGuarThe ProGuard Quietear Earplug is truly innovative earplug designed and patented offer variable noise reduction (VNR) technology, letting you hear what you need to hear (voices and other sounds in the voice frequency range) while protecting you from dangerous higher frequencies, and providing increased attenuation as the noise volume at the ear increases. Notes: Shooterplugz will give the user maximum hearing protection from high impact noise peaks associated with guns. Developed originally for military and police use, they come as standard fitted with a highly specified passive impulse filter (ANSI IPIL certified up to 166 dB). Which will allow instructions, conversations and alerts to be heard but clamping sound peaks instantly to reduce the possibility of hearing damage yet retaining the user's spatial awareness: essential in hunting and combat situations. The filter also allows air to circulate within the ear canal for all day comfort, having undergone full environmental testing in extreme conditions. A detachable elasticated lanyard cord is also included. The filter can be simply removed and replaced to enable the eartips to be cleaned in warm soapy water for hygiene purposes. The ShooterPlugz filters can be fitted to custom moulds for extra added comfort if required. Notes: With a noise blocking rating of 32dB, Silentear earplugs have one of the highest blocking capabilities of any reusable earplug made in the world, making them ideal for sleeping and general noise protection. They are made from a non-allergenic pre-moulded silicon rubber that is filled with gel to truly take up the shape of the ear canal. They are comfortable, discrete and reusable. - Patented structure consisting of a durable outer shell of soft,yet tough silicone rubber, filled with sound-deadening silicone gel inside gives SilentEar the highest rating of any reusable earplug in the world today (NRR 32)! Notes: Problems sleeping due to excess noise? Neighbours, partner snoring - all these can be a distraction at night. SleepPlugz can help; with their high noise rating they will decrease the surrounding sounds to a tolerable level, helping you to drift off. ProGuard SleepPlugz will reduce the sound level by a CE certified 24dB, eliminating or reducing sound to a non intrusive level and not totally block it. Allowing you to still hear your morning alarm call or any audible warnings but will be enough to enable you to get a decent night sleep. For example some snoring can be as loud as 90dB that's probably the same as a car horn, the SleepPlugz will reduce this down to around 65dB a much more tolerable level. Most moderate snorers are about 70-75dB, the reduction is down to 50dB, so sleep is much easier. SleepPlugz' elegant design also offers an open air passage to the ear, minimising the occlusion effect*, whilst keeping the ear ventilated and cool for optimum comfort during the night. Supplied with two sizes of soft, pliable eartips to suit most ears, they will slip easily into your ear without any discomfort. Just remember it may sound unnaturally quiet for the first night. After that you'll wonder why you didn't use them earlier. *Occlusion effect occurs when using some earplugs, typically low frequencies of your own voice can be transmitted through bone conduction.